The art of script writing enjoys a prominent place in modern calligraphy since it adorns many of the Wedding invitations that calligraphers are commissioned to produce. Any technique that can add flair to one's script without requiring many hours of practice would be of great value. In this article, I will describe such a technique. Specifically, we will examine a novelty script from long ago called Needle Stitch Script. It should be noted that this technique is applied to lowercase letterforms. These are used in combination with traditional Spencerian or Copperplate style capitals. Please refer to my instructional exemplar in Figure 1. During a period that extended from the mid-late 1800s through the first half of the twentieth century there were American pointed pen calligraphers, then referred to as penmen (men and women) who possessed script-writing skills rarely seen today. One such individual was Francis B. Courtney (1867-1952) (1). Even among the best calligraphic pen artists of the day, Courtney had the well-earned nickname as 'The Pen Wizard'. His skill with the flexible pointed pen was truly remarkable. Please visit http://www.zanerian.com/FBCourtney.html to learn more about this historical American pen artist. Courtney originated and/or utilized several 'novelty' scripts. One of the most popular of these novelty forms was an interrupted shaded script that we now call Needle Stitch Script (NSS). A wonderful specimen of Courtney’s NSS can be seen in Figure 2. In reality, we do not know what Courtney actually called this script variant. 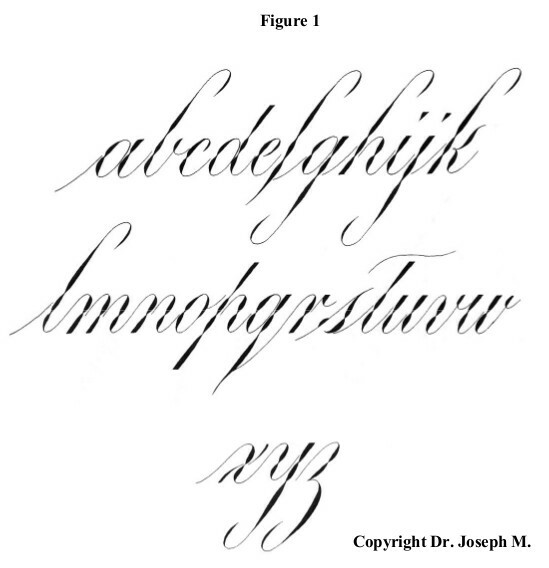 To my knowledge, the first usage of the term NSS in reference to this particular style of script occurred in Michael Sull's important two-volume work Spencerian Script and Ornamental Penmanship (1). In all the specimens I have seen of Courtney's NSS, the interrupted shading was used exclusively for lowercase letters. As previously stated, the capital letterforms were not modified. Let us examine how this stunning yet simple script variant is formed. First, anyone who has some level of fluency with script in the Copperplate style lowercase letters can easily execute this script with just a little bit of practice using your own lower case letterforms. It is important to stress that you do not need to learn another alphabet. Simply apply the technique to your current hand. 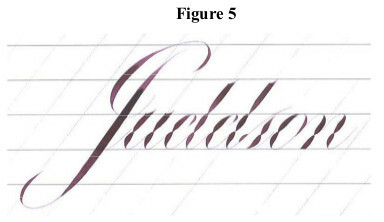 In fact, this technique can be applied to almost any shaded script form. My letterforms are heavily influenced by The Zanerian Manual of Alphabets (2). As you already know, shades are created by applying pressure on the down stroke. Figure 3 shows how the Needle Stitch shade is created. In this diagram nib pressure is represented by nib position markers. 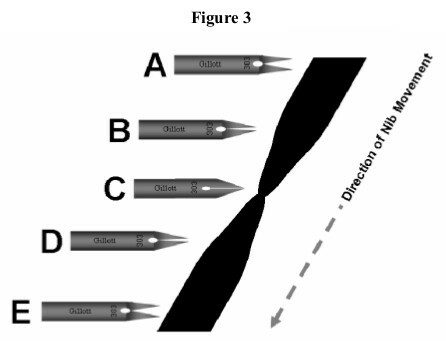 The width of the nib tine spread indicates pressure applied to the nib, wide or narrow positions indicates increased to decreased pressure, respectively. 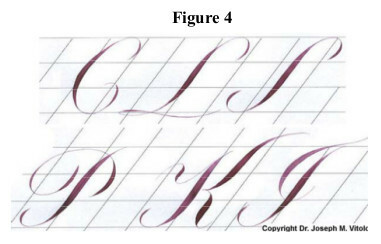 The entire black shaded stroke in Figure 3 is made without lifting the pen off the paper. In other words, the stroke is continuous. However, the difference is in the variation of pressure applied during the stroke. The ‘dance of the pen' is a familiar concept to many calligraphers. This particular description of pen movement is especially appropriate for NSS. Begin the stroke with maximal pressure indicated by Figure 3, nib position A. As you proceed downward begin gradually releasing pressure at position B, transitioning to little or no pressure at position C. Continue without lifting your nib and immediately begin applying downward pressure through position D, ending with maximal pressure at position E. The overall effect would be to create a constriction in the mid-portion of the shade giving it a ‘stitched’ appearance. While there are no absolute rules, there are some general guidelines that govern this script. The first and possibly the most important rule is to 'be consistent' with the placement of your shade interrupts. This means forming all your letters in a similar manner. All stem loop based letters should be formed using the same numbers of shade interrupts, etc. Next, for letters or letter portions contained within the baseline and header such as 'o' or the lower half of an ‘a’ or 'd', try to keep the 'notch' at or slightly below the midway point of the shade. Refer to my exemplar in Figure 1 for my take on applying these concepts. To further increase the overall effect of these forms I created stem loops that are not loops. Instead they have a hook finish that I like to call 'fish hooks'. As I previously stated, the NSS lowercase letters were used with regular capital letters. However, I applied this ‘fish hook’ finish to certain capital letterforms to make them work better with the NSS lowercase letters (Figure 4). Pictured are variants of the traditional letters: “C”, “L”, “S”, “P”, “K” and “I”. Figure 5, illustrates my use of the NSS variant on the name 'Juddson'. I kept the notch are just below center of the lower case letter height throughout. Please note that the notches or stitched appearance is on the lower case letters while the capital “J” has the 'fish hook' motif on the top and bottom of the letter. It is my hope that you will try this wonderful script variant and allow your pen the creative freedom to 'dance' across the page.